Sapphire's are generally well known as being blue, but can be nearly any color except shades of red or pink (since those are called rubies). It is associated with the values of truth, sincerity, commitment, and loyalty. The blue color is by far the most popular color for sapphire but orange-pink, golden, white, and even black have generated much interest in the the past years. 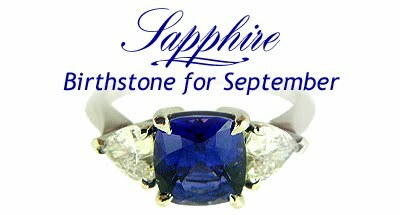 Sapphires are found in many places throughout the world and are extremely durable (only diamond and moisannite are harder).